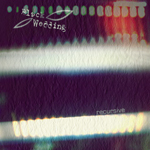 Black Wedding is a collaboration between musician Joshua Heinrich (fornever) & music journalist Julie Johnson (Grave Concerns) of new wave filtered through a darkwave sieve. Silber Records have been rolling out their 5in5 project where artists record a 5 track EP that goes for a total of 5 minutes to help artists who don’t have the time or energy to put together a full album the chance to get something out. This release comes from duo Black Wedding who have been around for some ten years but have had few releases due to other commitments. The opening track Breathe is a major highlight and a superb example of what can be achieved in just over one minute. Launching straight in, there is a deep spacey new age atmosphere packed with action. While the track is extremely short, like a piece of supreme dark chocolate, its extreme richness makes it more than satisfying! A moment is a racey 30 second keyboard led instrumental in the vein of Mike Oldfield’s more electronic work. Blinds is an energetic dance tune that bounces about with great speed while also feeling very chilled out and laid back. Pre curser has the name suggests is the stripped back intro to the closing tune Curser, a deep and spacey new age tune full of spacey atmosphere with an echoing techno twist. This is a brilliant release that is brave, creative, and tightly packed with activity. This is one of the shortest releases I’ve listened to, and yet it feels no less than complete! North Carolina experimental label, Silber Records is back with a new release, Recursive, the debut EP from Black Wedding. The duo is a collaboration between musician Joshua Heinrich (fornever) & music journalist Julie Johnson (Grave Concerns), featuring new wave filtered through a darkwave sieve. The EP is part of Silber's 5in5 series, which sees artists doing 5 tracks with a total run time of 5 minutes. With some danceable beats, atmospheric vocals and an overall ethereal feel, the five tracks are rich with sonic imagery. US band BLACK WEDDING is the creative vehicle of composer and musician Joshua Heinrich and lyrics writer Julie Johnson, and have one full album and a handful of single and EP releases to their name thus far. “Recursive” dates back to 2015, and was released by US label Silber Records, as part of their ongoing 5×5 series of experimental EPs, where the concept is to explore five songs in five minutes. Besides two brief interludes, both of them effective and elegant in their own right, the greater part of this short EP is given to three songs stretching from 60 to 95 seconds in length. All of them with a distinct pop music feel to them, all of them creations that by and large will be filed under either the synth pop or the new wave category. Sparse electronic rhythms, a dominant synth bass and keyboard motifs support the dark toned, slightly raspy lead vocals, and for me at least each of the compositions have it’s own distinct flavor. Generally speaking I’d say they are darker takes on the music by Pet Shop Boys, Frankie Goes to Hollywood and Depeche Mode respectively. Compelling tracks in their own right too, and each of them with a concise start and finish to boot. Those with an interest in and strong affection for mainstream synth pop and new wave as it was explored in yesteryear by the great, popular British bands might want to have a go at this one, and then especially if songs of that nature given a darker mood and atmosphere sounds compelling. De EP is een “5 in 5” uitgave van Silber Records. Het doel van dit soort opnames is om via een EP 5 opnames te laten horen die samen maximum 5 minuten duren en zo artiesten de kans geven hun kunnen te tonen. In dit geval betreft het hier Black Wedding. Een samenwerking tussen Joshua Heinrich (Fornever) en muziekjournalist Julie Johnson (Grave Concerns). Vijf minuten is kort en er zitten tracks in die maar een tiental seconden duren. En toch heeft het wat: deze EP moet je beluisteren als een muzikaal verhaal/schets. En je zal merken dat je hier in vijf minuten een uitgebreid palet te horen krijgt : Darkwave die gaat van industrial tot een romantische/melodiueze pianoriedel. Verscheiden, maar toch met samenhang en heel verhalend. Mijn interesse voor deze band is gewekt en ik zou heel graag meer moois van deze band horen. 5 in5 als opzet geslaagd? In dit geval zeker. Nouvelle escapade dans l’univers de Silber Media pour leur cinq chansons en cinq minutes. Ici, il s’agit d’une collaboration entre un musicien, Joshua Heinrich, et une journaliste musicale, Julie Johnson, qui célèbrent ici leur noces funèbres loin de Tim Burton. La darkwave esquissée ici est assez immédiate dans son approche, sans doute trop évidente par certains aspects. C’est cependant tout le péril de l’exercice, exposer sans trop se montrer, sans trop grossir le trait. Le duo parvient cependant à livrer une pentalogie synthétique, ondulante et crédible, qui se laisse écouter et animer de mouvements de bassin.